In 1952, an emissary went to Ayatollah Boroujerdi (the highest ranking Shi’a cleric) to ask him to tell members of the Fedayeen-e Islam not to engage in disruptive and violent acts. Boroujerdi did not relent. After all, he and Ayatollah Kashani were the spiritual leaders of the Fedayeen. Since long before and during the 1950’s, members of the cult were engaged in acts of violence including the murder of historian Ahmad Kasravi, journalist Mohammad Masoud, PM Razmara, and members of the Bahai faith. That emissary was my father who had been given the task by Mohammad Mosaddeq. Even though many Bahais had supported Reza Shah , he had chosen to close down their main schools, Tarbyiat. Historians interpret this move differently, some arguing that in his decision to close the Bahai schools the Shah was motivated less by anti-Bahai sentiments than by a suspicion of anything beyond his control. Bahais at times suffered discrimination, but they also grew in number under his rule, encountering less violence than under the Qajars. 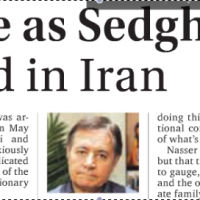 Nearly four decades later, a General, who had broken down Mosaddeq’s house door and was involved in the coup against his government, was given clemency by the newly established Islamic regime. Under Mohammad Reza Shah, he was given the task of desecrating Hazirat ol -Qods, the main shrine  of the Bahais. The General’s name was Nader Batmanglidj. After the fall of the Shah, as a number of generals were executed, his life was spared because of his role in the destruction of the shrine. Recently I came across an informative but disturbing article , “The stabbing of Dr. Berjis,” from the hand of Nasser Mohajer, published in Baran, Spring/Summer 1387/2008, regarding the killing of a Bahai doctor in Kashan. This happened in 1942. Dr. Sulayman Berjis, whose ancestors had come from Hamadan, had moved to the city of Kashan with his family. He was a physician doing good deeds for the community and saving lives in his practice. He had a pharmacy where poor people could get free medicine and treatment. He was also the head of the Bahai community in a city where Bahais once thrived. He had acquired a good name because of his compassionate work. One day, a few young men entered his practice, asking him to come and help a sick person. He left his patients and went with them to a location where he was met by another man. They threatened him that if he didn’t abandon his faith, they would kill him. Realizing that he was trapped, he tried to escape to a nearby house. But the four killers went after him with knives. They caught him, threw him down and viciously stabbed him to death. Rasoul Zadeh, their leader, (In June 1988, Kayhan published Haj Rasoul Zadeh’s obituary as having been a devout Muslim and a true follower of Navab Safavi, who had engaged in the heroic act of killing a Zionist element in Kashan!) then cut his throat. Blood was everywhere. Dr. Berjis had done nothing wrong. In fact, he was an exemplary citizen and a dedicated doctor in a place where his services were much needed. He had saved lives and was in the prime of his life (he was only 54 when he died) but he lost his own life because he was a Bahai. The murderers went to the police and confessed to the killing. They were proud of their action and had no remorse. After all, the killing was done according to a Fatwa (religious decree) issued by Ayatollah Gharavi , the local Grand Mojtahed ( highest cleric in town). A trial took place and after 8 months of investigation, upon the orders from Tehran, all four (and an additional four more who were co-conspirators in the crime) were acquitted. All the young men, ages 17 and 18, barely having grown a beard, had been members of the Fedayeen-e Islam. Kashani and Boroujerdi (the latter being a staunch anti-Bahai ) had intervened on their behalf and had asked that they be set free. Their request had been granted. The killers went free while an innocent doctor had been given the death sentence. His family never got any form of justice. They had quietly buried him in a cemetery designated for Bahais. (See article that details the entire episode and the trial). In 1979, shortly after the Iranian Revolution, the Bahai cemetery in Shiraz, one of the largest in Iran, was desecrated by extreme elements. Bahais were rounded up and beaten. Many were arrested. Families were dispersed. Many were not able to attend universities as a few students who were working at a grocery store in the Washington area and had left Iran through Turkey told me. They said they had wanted to stay and continue with their education in their hometown of Shiraz if they had been allowed. But they were denied their basic right as citizens to get an education. “Compared to other religious minorities in Iran, the Bahais lived under much harsher conditions, for they were the only religious minority that was neither officially recognized nor given freedom of worship.” (The Forgotten Schools: The Baha’is and Modern Education in Iran, 1899-1934, Soli Shahvar). The Islamic Republic is merciless when it comes to members of the Bahai faith. It is the greatest sin to be a Bahai because in the eyes of Islam the idea of divine revelation after the death of the Prophet Mohammad—the Seal of the Prophets— is unacceptable. The regime’s Shi’a leaders consider the Bahai faith dangerous; to them it is the highest form of apostasy. The Bahais are also branded as Zionists. One reason for this is that Mirza Hossein Ali Nouri, aka Bahaollah, who was forced to leave Iran, ended up in Ottoman Iraq and by way of Istanbul went to Palestine where he died in 1892 in the city of Akko, now in Israel. Following an anachronistic reading of history, the clergy see him and the Bahais as brothers –in- arms of the Jewish state and its potential ally. According to a brochure published in 2009 by the International Federation of Human Rights Communities (FIDH) on the history of execution in Iran, there are about 300,000 Bahais in Iran( It is inherently difficult to establish an accurate number). “Not only they are denied their civil rights but the number of executions has been higher than any other religious minority.” The same report states that between 1979-1980, more than 200 Bahais had been executed or murdered. Fifteen others had disappeared most likely killed. 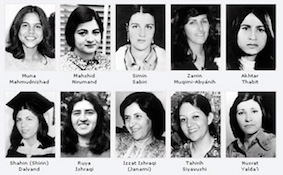 In 1984, in Shiraz alone, 10 Bahai women were executed after disobeying orders giving up their faith for Islam. One was Mona Mahmoud Nejad, who at the time of her arrest was 16 years old. She was seventeen when she was executed in Adel Abad prison in Shiraz. Another 15 year old boy, Peyman Sobhany, was beaten and then stoned to death. In recent times, a number of Bahai leaders and community members have been arrested and incarcerated. It is now a repeat of what took place almost three decades ago. Bahais are not just targeted by extreme elements of the Islamic regime. The sad part is that even a Khatami official told me once that Bahais are not to be supported even if they are imprisoned. I shook my head in disbelief and my reply was (I know I am not alone in this respect as many Iranians and Iranian Americans have expressed their outrage): “They are no different from you and I.” They should not be singled out for their faith or way of life, especially if they have committed no crime, are honorable citizens and love and worry about Iran as much as the next person. I remember talking with those young men while they were packing bags of grocery. They were two brothers and their cousin. I saw sadness in their eyes. They had lost a few years waiting in Turkey for their papers in order to travel to the US. One of them said to me, I wish I could go back and live again in the city of Shiraz where I grew up and had my roots. “I loved Shiraz,” he said. Hafez and Sa’adi of Shiraz, who wrote about beauty, wine and their love for mankind, are now turning in their graves at the thought of what is happening to Iran. 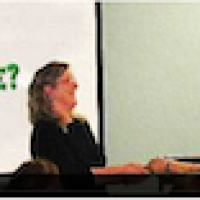 Wouldn’t you? The Baha’is, in accordance with direct teaching of the Baha’i Faith, obey the ruling government of the land in which they live. As much as this practice can be interpreted as “supporting” the ruling government, that is not case. In a worldview of dichotomies where people “have positions” or “take sides” or “support” or “reject”, are “pro” or “anti” one thing or another in the frenzy of debates and clashes, it is very difficult to fully understand this particular aspect of the Baha’i teachings. “Hazirat ol -Qods” (Haziratu’l-Quds), is an Arabic term that is used to refer to Baha’i Centres. The structure that the author refers to here was a Baha’i Centre for gatherings and meetings of the Baha’i community in Tehran. Posted in Editorial Notes, Persecution of Baha'is, Public Support, Shiraz, women. Persecuting Baha'is on the basis of the "Cult Scenario"
The “Hazirat ol -Qods” , is NOT an Arabic term for a Baha’i House of Worship. That’s Mashriqu’l-Adhkár. Hazirat ol -Qods is the correct term for the Bahai Centre. Sen, Thanks for catching the error. The note is corrected now.